Restaurant Jaques Chibois, Grass, France - GourmetVoyageurs.com. Grasse (near Cannes), Southern France. Chef Jacques Chibois had taken over from M. Alain Ducasse as our favorite chef in the year 2001 when we did our big story on him. At that time, he had just earned his 3rd Michelin star and it was very evident why. Since then, I think the pressures of maintaining that 3rd star that may or may not have anything to do with his cuisine, he has surrendered the first two and has settled comfortably into maintaining the single one and focusing on his food. We know many establishments in this day and age that are happy to have one but do not want the expense and stress of maintaining the next two. With his lovely Provençal Mas five star hotel "La Bastide de St. Antoine" is set on a hill side just on the outer limit of Grasse, the town famous for its perfumes, his "Restaurant La Bastide Saint Antoine", evokes the essence of the flavors of Provence but brought together in an entirely original and unique way. 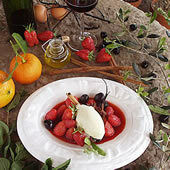 M. Chibois will make an olive oil ice-cream. "How can he do that and make it edible?" you say. Take our word for it, he can. He not only makes it edible but makes it manna from heaven. His ability to take products of the land, both rich and poor, and combine them in new and fascinatingly successful ways, makes his cuisine a taste exploration that is a must for all those who love the tastes of the Mediterranean. It is a crime that Michelin has yet to give him his third star. Certainly he is in the same class that select few world class chefs. While his technique and finesse of preparation and presentation is right up there with the very best, it is the clean and smooth style that predominates. His unusual pairing of flavors is simply a burst of enjoyment in the mouth rather than a labored attempt to be different. Whether you eat outside on the terrace with a view out over the Estérel and the bay of Théoule or sitting in one of the three the more formal dining rooms with their warm colors and one of which is a smoke-free zone, the surrounding ambiance is of Provence, reinforcing the tastes on the plate. The building itself has been lovingly restored and expanded, keeping all the while the style, colors and textures of Provence. Jacques Chibois, born far away in Limoge, which is another world of cuisine, is not just in love with the tastes of Provence, which he has adopted with vengeance, but especially with olive oil. He has even co-authored a book on the subject. Perhaps not being born in Provence has allowed him to relish its tastes and harvest bounty with greater perception than a native born chef. Perhaps it is the acreage around the Bastide that is filled with hundreds of 400 year old olive trees that stimulated his fascination. Like all chefs, his menu changes with the seasons and what is fresh from the growers. So while this is what we enjoyed, you will find a different menu when you arrive. We had a superb dish was his "Loup Au Citron et à La Verveine" a fish dish that brings in not only Verbena and Lemon flavors but also eggplant, olive oil, fennel, basil and the long, baton like zucchini of Nice. His "Langoustines aux Asperges" was a plate that kept providing layers of taste. The langoustines, (jumbo shrimp with claws), were sitting alongside seven spears of purple asparagus which were stringless and as soft as butter. Under the langoustines and asparagus were two purées, one of chick peas, the other of paprika and curry. Surrounding all was drizzled the famous olive oil. As the dish was consumed, a little dab of one sauce or the other, or combined made a set of variations of taste that was a real treat. 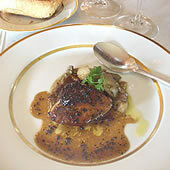 Normally I am not a lover of liver or foie gras, but his serving of the most tender, butter like duck liver served with hearts of artichoke and finely chopped black truffles on a purée of artichokes was to die for as was the Calamari served on a purée of chick peas with a sauce of paprika, saffron and the cooking juices with a little dot of white caviar. His desserts ranged from a millefeuille of caramelized apples, a plate of callissons with olive oil, an olive paste and wild wood strawberries to a plate of the wild wood strawberries of Mme. Valleriotti, with their unique taste served with a sorbet of verbena, a marmalade of jasmine and an olive paste. One superb dish was his "Loup Au Citron et à La Verveine". 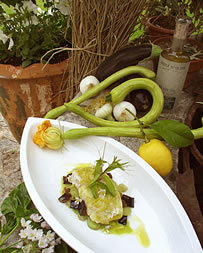 a fish dish that brings in not only Verbena and Lemon flavors but also eggplant, olive oil, fennel, basil and the long, baton like zucchini of Nice. 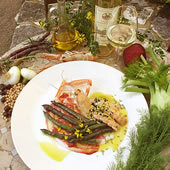 His "Langoustines aux Asperges" was a plate that kept providing layers of taste. The langoustines, (jumbo shrimp with claws), were sitting alongside seven spears of purple asparagus which were stringless and as soft as butter. Under the langoustines and asparagus were two purées, one of chick peas, the other of paprika and curry. Surrounding all was drizzled the famous olive oil. As the dish was consumed, a little dab of one sauce or the other, or combined made a set of variations of taste that was a real treat. His fixed price menus start at 290 FRF for a 3 course meal (lunch only), 490 FRF for a 5 course meal and 710 FRF for the 7 course meal but only as long as the whole table orders the same menu. While the restaurant is the raison d'être of the bastide, M. Chibois and his wife also created a small luxury 5 star hotel so that diners coming from a distance could spend the night. The 7 suites and 9 rooms are all charming decorated in soft Provençal styles and colors. So his guests can relax into good bottles of wine and not worry about driving afterwards.